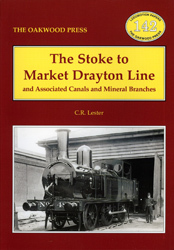 The history which began as a study of the Stoke-on-Trent to Market Drayton branch and its canal antecedents, but just as one railway leads to another, so research begets research and the end product includes some account of other ‘Drayton’ railways, whether constructed or not. Chronologically, however, pride of place belongs to the North Staffordshire Railway or ‘Knotty’ as it is affectionately known. A5 format, 72 pages, 40 illustrations.